The star of a thousand recipes is back on centre stage in a game of observation and speed. 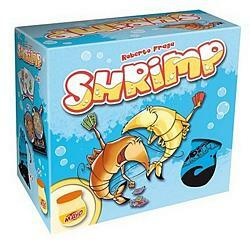 Look at the cards spread across three shrimp dishes. These crustaceans are different sizes, nationalities and colours! As soon as you spot at least one common criterion between them, shout it out and hit the jar of mayonaise to win the three dishes! The player who accumulates the most cards wins.